Efficient and super absorbent. Biodegradable cellulose sponge. Scouring part made from 100% recycled fibres. Specially contoured to clean hard to reach areas. Versatile sponge scourer. 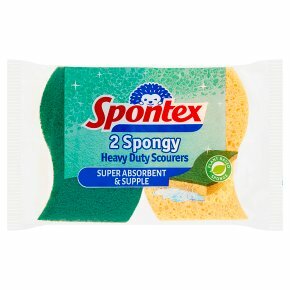 Spontex Heavy Duty Sponge Scourers are super absorbent, strong and efficient. The scourer part, made with 100% recycled fibres from recycled bottles, is great for all your daily washing up and the biodegradable cellulose sponge side is ideal for wiping down surfaces and mopping up spills. On top of that, the scourers are specially contoured for cleaning in hard to reach areas. Rinse thoroughly before and after each use. Do not use on non-stick pans and or any delicate surfaces. Test on an inconspicuous area before first use. We recommend changing your sponge scourer at least every 2 months, based on the average usage. Machine washable at 70°C. To avoid suffocation please keep the wrapper away from babies and young children.